Miso Udon Soup Recipe (from Paris!) | Good. Food. Stories. Other symptoms include the urge to frequently search Kayak for good airfare deals just so you can re-live your heaven at that destination again; desperately scouring INSERT FOOD GENRE HERE menus on Menupages to find something exactly the same; or drooling like Pavlov’s dog at the mere thought of that dish. If you were a D-list celebrity, Dr. Drew would certainly have something to say about you. As I’m sure you’ve guessed, I myself have felt super passionate like good ol’ Charlie about a heaping handful of culinary delights during my travels. The top contenders? Grilled feta cheese and banana peppers from Santorini, plum gnocchi with speck in a cream sauce from Lake Maggiore, and probably something you didn’t expect: a simple bowl of miso soup from…Paris. Yes, that’s right, not Tokyo, but Paris. 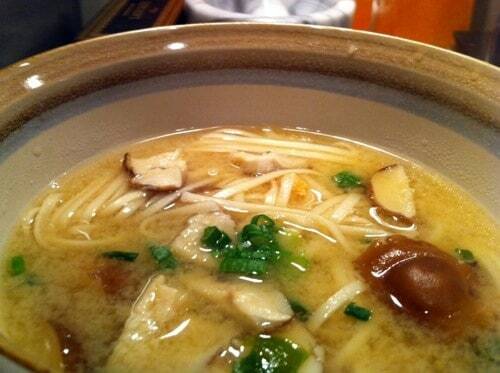 I haven’t been to Japan yet, but I would imagine this lovely bowl of soup would fit right in there. The scene of the crime was Kunitoraya, a charming, organic-looking little Japanese Udon restaurant on Rue Sainte-Anne in the 1st arrondissement. This street houses tons of great Japanese restaurants, but Kunitoraya is arguably the best and hippest of them all. I had been Boston Terrier-sitting my friend Laura’s pup while she had skedaddled off to Amsterdam with her beau, and she suggested I grab lunch there since it was nearby. Off I went to order the miso udon with pork and salsify that she had suggested, and out I came, a changed woman. The miso udon soup was served steaming, piping hot in a ceramic bowl, and the noodles were just chewy enough, the broth was just salty enough, the salsify was just earthy enough, the pork was just bacon-y enough, and the scallions were just sprinkled enough. Divine. Now that I’m once again living Stateside, I have found myself guilty of Udon addiction. I sadly sit at the computer for way longer than a human should, desperately scouring Japanese menus online to find something exactly the same. Unfortunately, this situation has been unsuccessful, so I put myself up to the challenge of making it myself. For your information, Udon is a traditional Japanese noodle that is rather large and made from flour, water and salt. More common in regions of southwestern Japan, Udon is usually served in a very hot broth, but it can also be served cold just as well. It’s okay to slurp the noodles. The Japanese insist. To make the dashi, combine the kombu and bonito flakes with 2 quarts water in a large pot over medium heat and bring to a simmer. While waiting for the dashi to simmer, set a skillet on medium-high heat and add 1-2 tablespoons oil. When hot, cook the shaved pork until cooked through and set aside. Return to the dashi, and turn off the heat just as the water is about to boil. Pour through a strainer into a larger bowl to remove the kombu and flakes. Pour the dashi back into the pot over medium heat. Whisk the miso into the dashi until smoothly blended. Add the shiitakes, then shave the skin off the salsify with a vegetable peeler, and afterward, peel the rest directly over the dashi. Note: Don’t peel the salsify and set aside ahead of time because the salsify will brown rather quickly. Add the udon noodles and once the broth is about to come to a boil, ladle out the soup in bowls, add the pork and garnish with a pinch of scallions. Serve immediately.